Tilapia are listed as one of the world’s 100 worst invasive species and considered the cane toads of our local waterways. As part of ReefBlitz 2017, FPRH is hosting a community event to raise awareness about the problems Tilapia cause in our waterways and what you can do to help care for wetlands to help improve waterway health around our region. 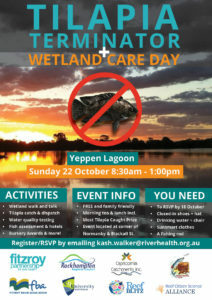 Activities throughout the day include a tilapia catch and dispatch, wetland walk and talk, water quality and fish assessments with prizes to be won. It’s also a great opportunity to put yourself in the draw to win a GoPro Hero5 in time for Christmas! We’ll also be awarding our annual Creek Care Bursaries to the 2017 Winners. This is a family friendly, FREE event including morning tea and lunch. RSVP your interest by emailing kash.walker@riverhealth.org.au including number of people attending and dietry requirements. DID YOU KNOW? Once Tilapia have established in a waterway they are deemed impossible to eradicate; prevention is the only solution! Find out what you can do to help stop the spread… they are already in some creeks and rivers in the Fitzroy Basin, we don’t want yours to be next.